‘Day of the Wacko’ from 2002’s directed by Marek Koterski. Sad-sack neurotic tries to find solace from the nagging day-to-day stresses of academic life in this melancholy comedy, reminiscent of Krzysztof Kieslowski's White. It’s 24 hours in the bitter life of a frustrated divorced Adam (Marek Kondrat) who stays in the vicious circle of his numerous obsessions. 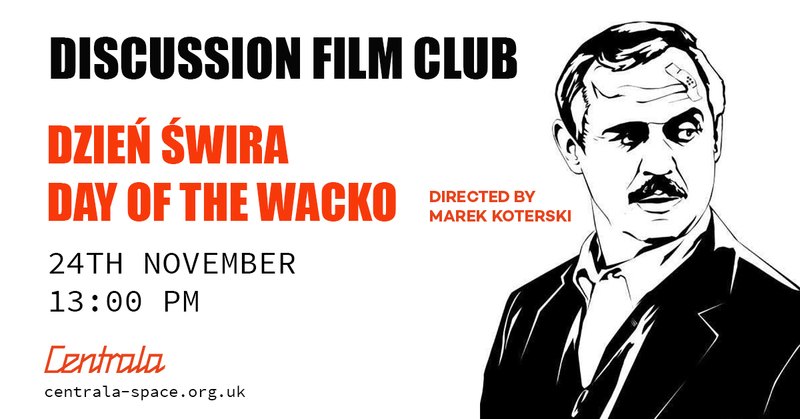 Discussion Film Club is a programme initialised and organised by Centrala and Central Library, West Bromwich in Birmingham. FDC predominantly focus on the accomplishment of Polish and Eastern European cinematography, presenting classic films as well as recent ones. The primary assumption of DF creates a pleasant atmosphere among West Bromwich’s neighbourhood community, also for all Birmingham’s inhabitants.